Former Yahoo News anchor Katie Couric tweeted Monday night that she was "getting whiplash" during President Donald Trump's speech on U.S. operations in Afghanistan. 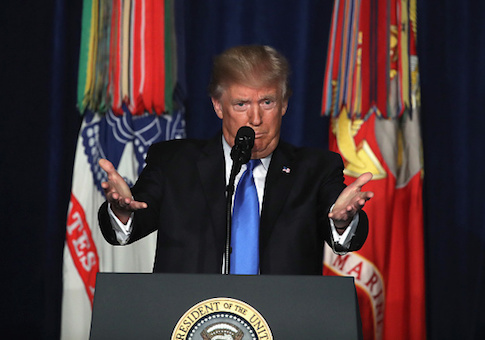 Trump delivered a prime-time address to the nation about his strategy for the war in Afghanistan on Monday. Before he described the newly reevaluated strategy, Trump spoke about the importance of national unity, and how when one part of America is hurting, all of America is hurting. "The soldier understands what we as a nation too often forget, that a wound inflicted upon a single member of our community is a wound inflicted upon us all," Trump said. "When one part of America hurts, we all hurt. And when one citizen suffers an injustice, we all suffer together. Loyalty to our nation demands loyalty to one another. Love for America requires love for all of its people." Couric tweeted during the speech that she was getting whiplash from Trump's views on "hate" and "division." Watching @realDonaldTrump and once again getting whiplash re his views or hate and division. Couric appeared to reference Trump's comments the week prior regarding the protests in Charlottesville, Va. when he said there were good people on both sides. Chris Cilliza, editor-at-large for CNN politics, also believed Trump's opening comments were in reference to Charlottesville. Trump trying to clean up the mess he made in Charlottesville with this start of the Afghan speech. Other media figures criticized Trump's speech for his decision to send more troops to Afghanistan.
.@realDonaldTrump is reading the best words. Badly. Breitbart News also responded less than positively to Trump's Afghanistan strategy. Breitbart is headed by Steve Bannon, who was Trump's chief strategist until he was let go last week. This entry was posted in National Security and tagged Afghanistan, Chris Cillizzaa, President Trump, Social Media. Bookmark the permalink.